The National Investment Banking Association (NIBA) is very pleased to announce its 121st investment conference, which was held February 23-24, 2012 at Le Pavillon Hotel in New Orleans, LA. 2012 NIBA New Orleans Investment Conference Agenda Now Available! Click Here! Affordable Green Homes International, Inc.
REGISTER NOW FOR OUR JUNE 6-8 2012 NEW YORK, NY CONFERENCE! With a history stretching back to the Gilded Age and impeccable décor throughout, Le Pavillon Hotel piques the imagination in a way that even the emperor himself would applaud. Located in the heart of downtown New Orleans, Hotel Le Pavillon sits adjacent to the historic French Quarter, only five short blocks to the celebrated music clubs of Bourbon Street and the famous restaurants and antique shops of Royal Street. Within a five-minute walk you can find yourself at the Louisiana Superdome for a NFL Saints football game or at the New Orleans Arena for a world-class concert or NBA Hornet’s basketball game. If your travel to New Orleans is conference related, you will be pleased to know that Le Pavillon is only eight blocks to the Morial Convention Center, the largest convention center in Louisiana. During Carnival season in New Orleans, Le Pavillon Hotel is an ideal location as Mardi Gras parades roll only two blocks away from the grand entrance of this classic hotel. Built in 1907, Le Pavillon Hotel is a member of Historic Hotels of America and maintains membership in the Leading Hotels of the World. Le Pavillon Hotel has been the proud recipient of AAA’s four-diamond award since 1996. 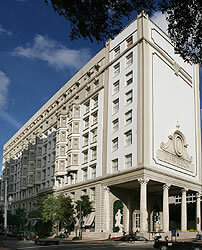 Out of hundreds of eligible New Orleans Hotels, Le Pavillon Hotel was named to the “Gold List” by Conde Nast for 2005.